This recipe is one of the kids’ favorites. I just set out all the toppings and let each person add their favorites! Spray slow cooker with nonstick cooking spray. Place roast inside slow cooker. In a separate bowl, mix together the beans, onion, garlic, green chilis, chili powder, cumin, oregano, and salt. Pour over the roast, then add enough water to the slow cooker so that the roast is almost completely covered. Cook on low heat for 8-9 hours, checking about half way through to make sure there is still water and add more water if needed. When roast is done cooking, remove bone and fat and shred using two forks. 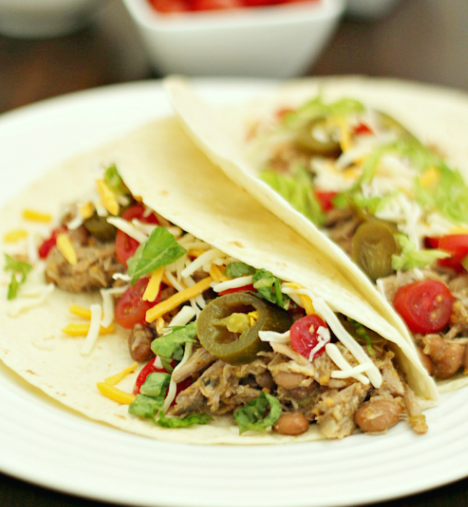 Return pork to the slow cooker in the leftover liquid and serve on tortillas with your favorite toppings. Nice and easy. Thank you and have a Wonderful Sunday. Could you use a lower fat piece of pork like pork loin instead? Pork loin will work great with this recipe too!